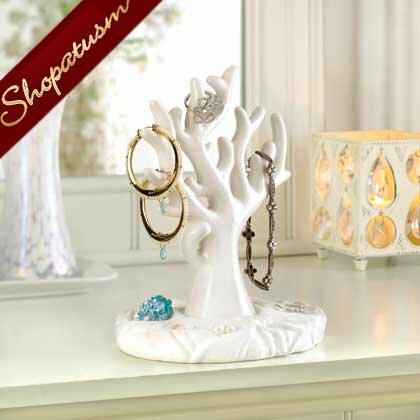 This is for a white porcelain coral branch jewelry holder organizer from Shopatusm. Display your glittering baubles upon a jewelry holder that's a treasure all its own. It presents endless possibilities for hanging bracelets, rings, and necklaces, and the base has nooks to nestle stud earrings and more! Velvet Lining on bottom. Weight 1 lb. 5 1/2 inch x 4 1/4 inch x 7 inch high. Porcelain.